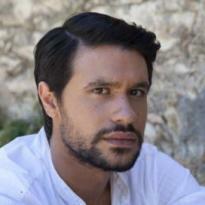 Orpheas Avgoustidis, son of actors Mary Tzobanaki and Dinos Avgoustidis. Debuted in 2005 in the film "Loafing and Camouflage: Sirens in the Aegean Sea” directed by Nikos Perrakis. Followed by the television series "Loafing and Camouflage” which was screened by NET season 2006/2007 and in which he starred as the soldier Yannis Papadopoulos. He has participated in the police television series for Alpha “10i Entoli” in the episode" Virtual Reality " where she starred alongside Danae Skiadi. For the 2007/2008 season he starred in the romantic series for Alpha "I got red glasses” in which he portrayed the young teacher - Dimitri, who has a relationship with a woman 12 years older than him - Marianna (Evelina Papoulias) He performed in the Theater Diana, for a second season, the show "Night radio murder" with Helen Rantou and Basil Charalamopoulos. For the 2008/2009 season he did a quadruple appearance in the following movies: starred with Akis Sakellariou and Faye Xila in the comic strip by Yiannis Xanthopoulos “All right"; appeared as a guest star in the remake of the 1959 classic Greek film "Ilias the 16th" directed by Nikos Zapatinas, starring Petros Filippidis. He co-starred with Basil Haralambopoulos in the movie "Bank Bang"directed by Argyris Papadimitropoulos, and "Dying for you" with Helen Rantou. In the same year he also starred in the theater show "The vrochopoios" directed by Helen Rantou at Theatre Diana and appeared in the juvenile series of Mega Channel "Agria Paidia” and the comic series "Seven deadly-mother-in-laws."